Film journalist, Nikki Baughan, turns a keen eye and ear to Lynne Ramsay's use of cinema and the ways in which she evokes the fragile state of mind of her characters. 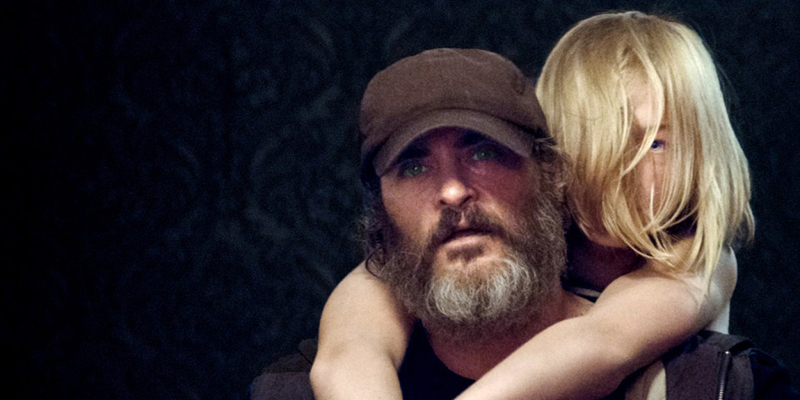 With You Were Never Really Here, Ramsay's disorienting camera and Jonny Greenwood's abrasive soundtrack find harmony within the hulking frame of Joaquin Phoenix, whose powerhouse performance provides the damaged soul of this striking film. To say that Lynne Ramsay has a powerful understanding of film may be an obvious statement, given that she’s made several critically acclaimed, award-winning features and shorts. Yet her approach to filmmaking goes beyond a mastery of the craft to an innate appreciation of cinema’s immersive power. She is skilled at bending the rules, at ensuring that every on-screen element, whether seen or heard, is authentic to her characters, and at compelling her audience to become an active participant in the story. Ramsay’s richly textured approach was first showcased in her 1996 NFTS graduation short Small Deaths (which won the Prix du Jury at Cannes that year) and developed through her feature debut Ratcatcher (1999), an evocative depiction of childhood in 1970s Glasgow, and follow-ups Morvern Callar (2002), a commanding testament to female resilience, and 2011’s We Need To Talk About Kevin, a brutally honest exploration of the often-harsh realities of motherhood. With her latest work, an adaptation of Jonathan Ames novel You Were Never Really Here, Ramsay once again teams up with like-minded collaborators to deliver another visceral study of life lived on the limits. The film packs a sensory punch from its opening moments. An assault of sound — water, numbers counting down, snatches of aggressive dialogue — builds in intensity until, suddenly, we are confronted by an unexpected image; the camera tight on the profile of a man as he gasps for breath, his head ensconced in a plastic bag. The focus then shifts to his hands as he cleans blood off a hammer, to a childish necklace which lies on the bed. His head stays resolutely out of shot as he leaves the room, the ‘Do Not Disturb’ sign hanging on the door now something of an irony. As composer Jonny Greenwood’s discordant score kicks in, we follow the man as he stalks towards the exit; a corridor prowl which will become one of the film’s unsettling motifs. As he emerges into the street, his hooded face is cast first in back alley shadows and then the neon strobes of a city as he slumps in the back of a cab. The music switches to an agitated electro-pulse as he arrives in the familiar skyline of New York City, and lets himself into a house. As soon as he opens the door the music abruptly stops; the sight of an neat, ordered home and an elderly woman asleep in front of the TV is, again, entirely unexpected. Through their easy banter, we discover that the man is named Joe, and he lives with his beloved mother. This virtually dialogue free introduction to the troubled Joe is essentially a series of rapid-fire vignettes which knit seamlessly together to give us a strong sense of his dissociation, his alienation, the fact that he’s barely holding it together. And none of this is provided by exposition or back story; it’s all there, in the moment, daubed across the screen in sound and vision. The story of anti-hero Joe (played in a knockout performance by Joaquin Phoenix) will unfold with this same sense of immediacy. While his narrative is fairly conventional — damaged man seeks redemption through violent justice — the filmmaking eschews standard structure and absolutely refuses to pander to its audience. As Joe spins further out of control, the film responds in kind; cuts are hard and fast, colours are dark and foreboding, sound is uncomfortable and overwhelming. Yet it’s all handled with total control by Ramsay and her team. Cinematographer Thomas Townend and editor Joe Bini have created a fragmented visual patchwork that speaks to Joe’s increasing detachment; heads are often out of frame, characters are usually off-centre, angles are sharp and disorienting and cuts are deliberately harsh. Camerawork is relentlessly intimate. There are very few wide shots, few opportunities for the film to breath —save for a key sequence in which Joe visits an upstate lake, the lush greens and tranquil surroundings only emphasising the oppressive horrors of his everyday world. Elsewhere, the colour pallette is muddy and foreboding; Joe’s NYC is not a gleaming city of dreams, but a dingy underbelly in which heinous things can happen behind any door; no matter the calibre of the address. Recurring visual motifs are also an effective, emotive shorthand. Joe is often seen in corridors and other dark spaces, a sense of entrapment that plays out in his desire to self-asphyxiate. The repeated use of mirrors reflects Joe’s disassociation and loosening sense of identity; furtive glances in his car’s rearview speaks to a past from which he can’t escape. This is fleshed out by brief, brutal snapshot flashbacks to a horrendous childhood and military service which left the mental scars that he is fighting, and failing, to scrub out. This claustrophobic atmosphere is also underscored by the film’s vivid aural landscape. Jonny Greenwood’s disconcerting score, which blends jarring chords, throbbing techno and classical strings, and Paul Davies’ atmospheric sound design work in tandem to force the viewer into Joe’s head. Ordinary sounds are heightened to ominous levels. Here, the bubbling of water, the rush of a train, the blaring of car horns and the babbling of inane conversation is not a normal city soundscape, but the incessant soundtrack of isolation. Moments of silence are equally as important; Joe’s mothers house, for example, is quiet and calm, the only place where he — and the viewer — can find a splinter of peace. With this approach (and much like Martin Scorsese’s Taxi Driver, that seminal New York vigilante odyssey with which You Were Never Really Here shares a nightmarish aesthetic) Ramsay is not inviting the viewer to pass judgement on Joe. Rather, by effectively splitting open his psyche, she is inviting her audience to be absorbed by this character to the very depths of his tortured soul. Glaswegian filmmaker Lynne Ramsay (We Need to Talk About Kevin, Morvern Callar) makes her long awaited return with the exhilarating You Were Never Really Here. By turns a visceral and captivating underworld crime thriller and an intense psychological study of a mind in turmoil, Joaquin Phoenix features in a career-best performance as Joe, a traumatised gun-for-hire specialising in rescuing young girls from abduction. When a mission to find a senator’s daughter spirals out of control, Joe’s past threatens to consume him – the job will be either his demise or his awakening. Aided by a hypnotic, propulsive score by Jonny Greenwood (Phantom Thread, There Will Be Blood) and a mesmerising visual style, You Were Never Really Here further secures Lynne Ramsay’s status as one of contemporary cinema’s most visionary directors. This is essential cinema that should not be missed. This article was written in partnership with StudiocanalUK, the UK distributor of You Were Never Really Here which arrives on screens Friday 9 March.